The Competitive Enterprise Institute (CEI) created an ad campaign pushing NBC’s “Meet the Press” to include climate skeptics in future broadcasts discussing aspects of global warming. NBC refused to run a televised version of the 30-second ad on its Jan. 20 episode, according to a CEI press statement. The ads, which will run in The Washington Post and The Wall Street Journal, push back against “Meet the Press” host Chuck Todd’s decision to exclude climate skeptics and calls for what CEI says is a real and open debate about the impacts of climate alarmism. 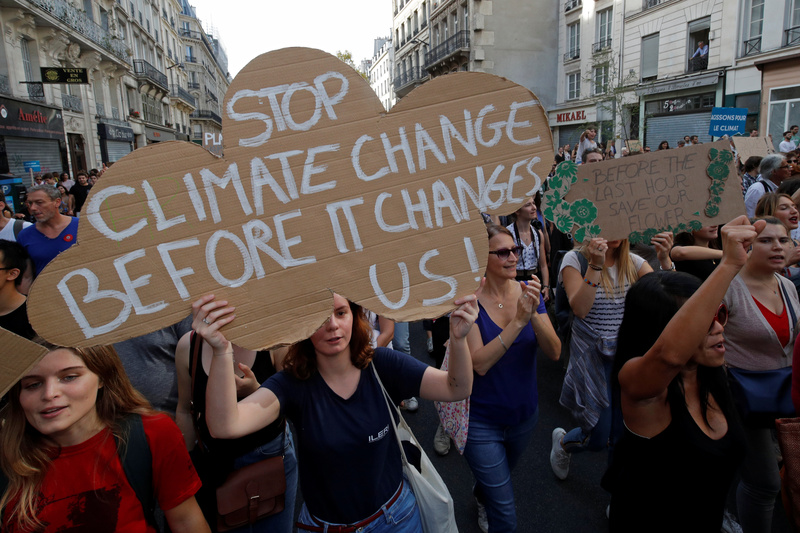 Protesters march to urge politicians to act against climate change in Paris, France, October 13, 2018. REUTERS/Philippe Wojazer. Outgoing Democratic California Gov. Jerry Brown was also on hand to discuss his solutions. He called rising global temperatures a serious threat, something akin to what Americans faced at the outset of WWII. He also said the U.S. is not doing enough to address the problem. Former New York City Mayor Michael Bloomberg made similar comments, telling Todd during the day’s program that he is still mulling a presidential bid in 2020. Bloomberg, a billionaire politician-turned-anti-fossil-fuel activist, said the environment should take precedent over even the economy. Democratic Sen. Bernie Sanders and other progressive lawmakers are angling to move the U.S. to 100 percent green energy within the next decade. Analysts warn such proposals could come with a monster price tag.